50 Premium Card Game Sleeves (88mm by 125mm). 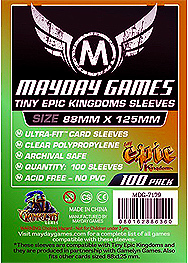 These sleeves are compatible with Tiny Epic Kingdoms and they are produced in partnership with Gamelyn Games. Also fits other cards sized 88mm x 125mm.